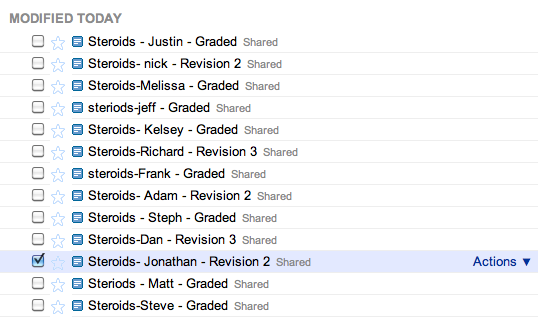 Google Docs is a fantastic tool for professional and student collaboration. After using Google Docs for an extended period of time, it becomes evident to most Google Docs users that your inbox can become a cluttered, hectic and confusing mess. Magnify that confusion X 100 when you start to have students share their documents with you for evaluation and grading and you can have a colossal mess on your hands. Class Period - Assignment Title - Student First Name ( & possibly last initial if needed ). 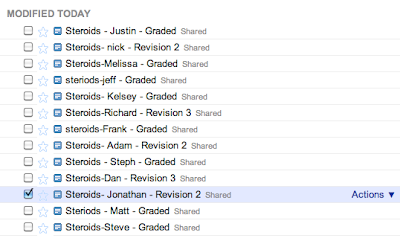 By following this naming convention, as students begin to share their work I can quickly scan to see who has shared their document and who hasn't and I can quickly organize my Google Docs inbox by dragging each file into the appropriate group folder for that class & assignment. 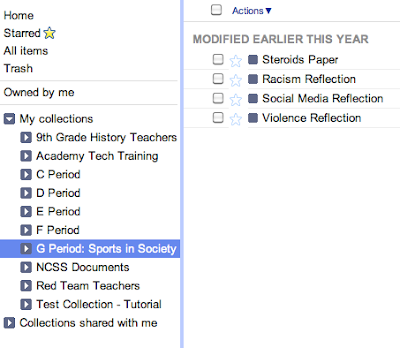 Once students have shared their documents with me using the appropriate file naming standards, I organize my Google Docs inbox by creating a new group (Google's version of a folder). 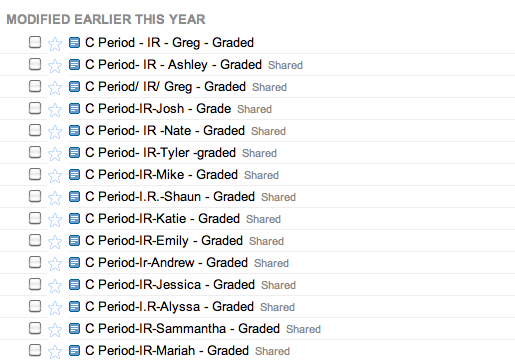 At the beginning of the year I create a Group for each class and then create sub groups within the larger class group each time a new assignment is shared. 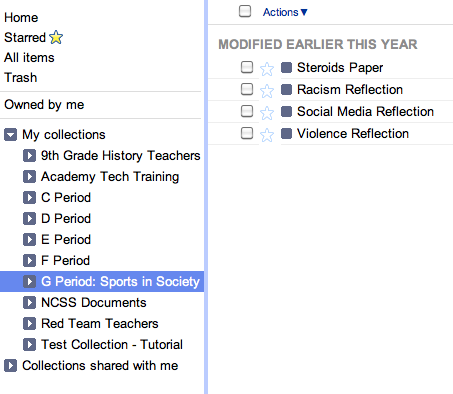 Here is a screen shot of what my Google Docs account looks like with this organization structure. The Group on the left, 'G Period: Sports in Society' is the first group I made at the start of the school year. The Groups, on the right, are sub groups that I made throughout the year, that are part of the larger 'G Period: Sports in Society' group. By using groups in this method, you are able to filter out the view of you Google Docs account and instead of seeing every document that has been shared with you by your students, you can limit your view to see just what you want to see. To get student papers into each group you simply have to drag the paper from the right, into the group on the left. Here is a video tutorial I created about the process of creating groups to stay organized. Probably more important than staying organized (although it does make the experience much more pleasant) the real power of using Google Docs with students is that it truly enhances student engagement and their active participation in the writing process. I have come up with a procedure that my students use that is initiated by changing the title of the document when the paper is submitted, revised and graded. To enhance the writing process further, while students are working on their documents and have shared them with me, I will leave them two types of feedback. 1. I will insert comments throughout their paper that appear in the right hand margins. 2. I will right a paragraph of advice at the end of their paper. When a student then reads the comments and advice, revises their paper and resubmits using the strategy I outlined above, I will notice the title change of the paper and go into the document to examine the changes. I use the revision history option to see any differences between drafts. To access the revision history of a document: File--->Revision History. Any changes to the document will be trackable in the right hand column with a time stamp for the change. This strategy allows me to quickly and easily make note of any changes and improvements to the document. Good luck using Google Docs...I hope this helps. Does this require every student to have a google account? Greg, have you experimented with the ability to mark a comment in the margin as "resolved"? If you want to use the process that I described in the post, then yes the students need to have a google account to be able to make documents and share them with you. If you want students to word on a document, you can simple create an open, completely editable document that does not require a sign in. However, students do not control the document. Thanks for reading, I hope this helps. I often leave comments in the margin and I do have students resolve the comments. It is a phenomenal tool and they can actually respond to a comment now as well & it creates a comment thread in the margin. Great ideas! It is always a daunting task to stay organized. Thanks for sharing. Thanks for the description of your process. I was writing a lesson plan to use google docs for the first time this year, and this will make the process a lot smoother. I have 6 preps: 6th grade Geography, 7th grade Geography, 8th grade US History, 9th Grade US History/Geography, 10th grade Civics/Economics, and 11th grade World History. Is there a way for me to use this without being bogged down? I like this process, and will share it with my teachers. Organization is always difficult. This is a great "open source" system. 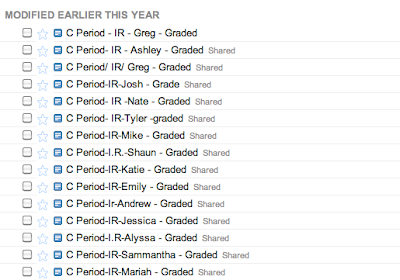 If your school in serious about GAFE you should check out Hapara's Teacher Dashboard.